The winner of the Sean Edwards Trophy for 2017 is Ben Barnicoat the award which was set up in 2015 in Sean’s name. Ben a 20-year-old Englishman from Chesterfield in Derbyshire claimed the Sean Edwards Trophy for a young driver who shows similar quality’s to Sean, Daphne McKinley Edwards (Chairman & Founder) said ‘when I watched Ben’s development over his first season in the Blancpain GT Series, his acceleration, commitment and drive is what stood out, he is a highly focused driver and definitely one to watch’. Ben is categorized as Gold, due to a title win in the Formula Renault NEC, but he started GT racing at the very end of 2016, and raced for Strakka in a McLaren for the full 2017 season, where he had a tough year because the team had technical issues. 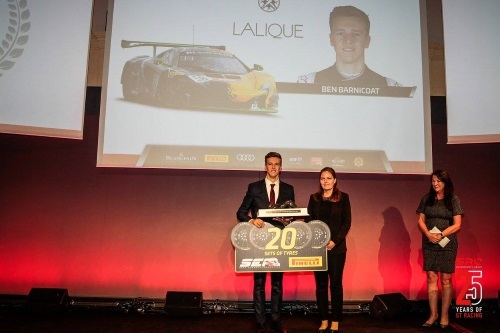 He was one of three nominees along with Dries Vanthoor, Fabian Schiller, the Sean Edwards Trophy was awarded at the end-of-season awards ceremony of BGTS, organiser the Stephane Ratel Organisation in Paris on Friday 24th November 2017, Nominees must be aged under 21 at the start of the season and compete in both the Endurance and Sprint Cup legs of the BGTS.